If you want a sublime, easy, all-day hike with incredible views of water, mountains, ponds and the possibility of seeing animals and birds, then Hermitage Point should be your pick. At the very least, it is one of my top choices. Sure, it is 9.4 miles round trip. Yes, it is a rather long drive from Jackson Hole (fifty minutes by way of US-191 and US-89N). But the hike is relatively flat (elevation gain of 440 ft.) and easy to follow. 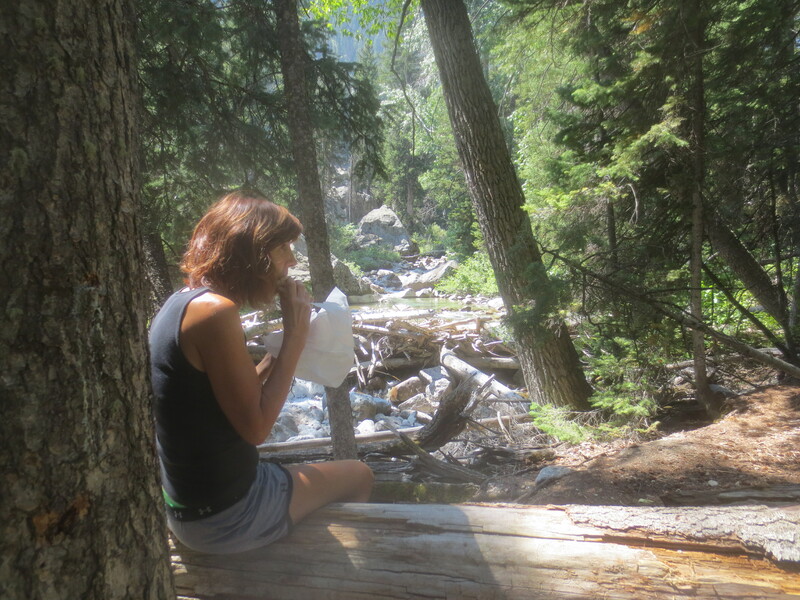 And, at the beginning and end, there is a park restaurant with all you need to start your day and replenish after the hike. To find the trail, follow the concrete road south that tracks along the boat landing area. When you reach the end of the concrete, follow the old gravel/dirt service road that runs along the Colter Bay Marina. While walking, take in the beautiful views of water backed by mountains (Mt. Moran and Rockchuck Peak). Soon, you will reach the Swan Lake/Heron Pond split. Veer right and head towards Heron Pond. You will notice that the path turns to a much narrower dirt path of the type that you would expect in the park. At the next junction (unmarked) head right towards Heron Pond [make sure that you pick-up a trail map to eliminate any confusion). In a few minutes, you will reach another junction. If you take the path to the right you will go uphill to an overlook with fabulous views. Continue further and that trail re-joins the trail you were on. Either way, after a short-distance, you will see an incredibly beautiful pond that will likely be filled with lily pads. Afterwards, you will have a rather lengthy trek through the woods before the terrain opens into sagebrush flats before coming at an end at Hermitage Point (make sure you follow the trail to right when you get to an “X” intersection, otherwise if you go left you will end up at Swan Lake.) 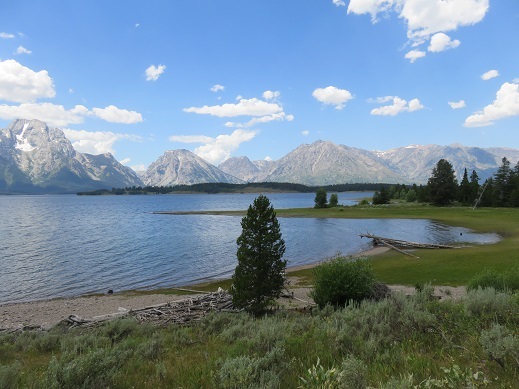 The views of the Tetons juxtaposed against Jackson Lake are magnificent at this stage of your journey. When you reach the rocky beach to your right, settle down for a well-earned sandwich and enjoy the magnificent views and the breeze. When it is time to go home I recommend retracing your steps. 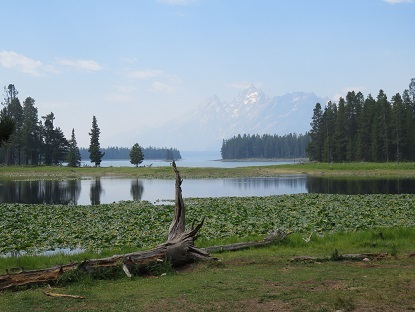 I have gone the other way on the southeastern side of the point and, while interesting (off in the distance you can see Jackson Lake Lodge and you pass a rather cool camp site), I don’t think it worth the seemingly slight extra distance. Life is sublime at the Teton Pines happy hour. On a whim, we drove five miles south of Teton Village to the Teton Pines Club House in January. For more than a week we kept passing the sign advertising a happy hour. Curiosity finally overcame us and we decided to go. Admittedly, we were not overly expectant. After all, Teton Pines is a country club – not the sort of thing my wife and I usually plan on going to when we visit Jackson Hole. But from the moment we walked in and found our way to the bar tucked into the back of the clubhouse we realized we had found something special. The huge glass windows looking out on a beautiful landscape perfectly showcase both past and present snowfalls. 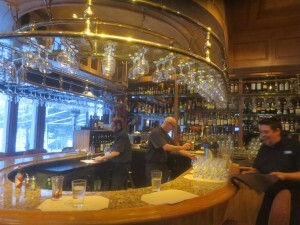 The bar is small and cozy; especially if you arrive before 5:00 p.m. and the extremely friendly bartenders have time to engage in conversation. The drink menu had some great combinations. My wife and I ordered a hot cider combination and our friends enjoyed a chocolate flavored concoction. But for those who aren’t looking for something quite so sweet there are plenty of other possibilities along with the normal top shelf liquor found at a well-stocked bar. Not only were they delicious, the portions were surprisingly large – and the price was right – $7 -$9 each. Four of us were satiated from eating those three choices. Happy hour is only available Wednesday through Saturday from 4:00 p.m. to 6:00 p.m. Unfortunately, it is only offered during the winter. Hopefully, that policy will change for the summer folks. On this web site, I only write about places I have enjoyed and will return to. Yesterday I went back again. This time the four of us ordered five different appetizers and then ordered repeats of two of them. Needless to say, we were not disappointed. Check it out at Teton Pines. Jackson Hole Favorites is not a political blog. But I can barely restrain myself when at one of the most magical times of the year in Jackson Hole – early October – the Parks are closed. 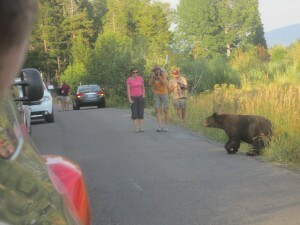 I was angry the other day when I walked up the Moose-Wilson road from Teton Village. I thought I would be able to go as far as the Granite Canyon Trail Head in Grand Teton National Park. But no, the Government shutdown brought to all of us by our dysfunctional government reared its ugly head. I hit a literal roadblock. This is what happens with a disfunctional government. 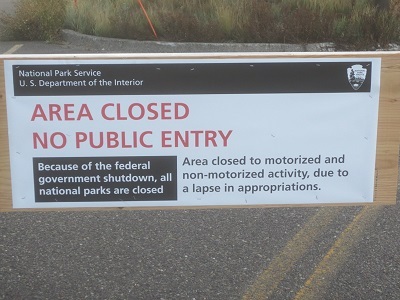 Why are the Parks closed? Who is at fault? Each of you has your own answer. But one thing is for sure, it is not the fault of Park employees. The rank and file who work for the Park service by and large does the job for the satisfaction it brings them. Certainly not for the money they are paid or the living conditions they endure. So, whatever your political views remember that Park Service employees do not want to be in the position they are in. They are forced to turn us away by forces beyond their control. And by the way, shame on any politician that attempts to use the fact that they are doing their job for political purposes. Because you see, those Park Service employees are some of my Jackson Hole Favorites. Honestly, my wife and I didn’t intend to go very far up Granite Canyon. Little did we know we would find one of most incredible destinations for a moderate hike that I have seen in Grand Teton National Park. My Real Estate Broker Recomendation If You Want The Straight Scoop! I met Darren Kleiman in early 2003, when I first became interested in purchasing a property in Jackson Hole. Our first contact was a cold call by me to the brokerage he was working for. Darren was patient, informative and honest with regard to the inventory in the price range I was prepared to pay. Shortly therefter I arrived in Jackson. Darren spent considerable time showing several properties without pressuring me to make a decision on any of them. Unfortunately, none of the listings met my needs. I certainly gained by soaking up the voluminous amount of knowledge that Darren imparted to me, and if he felt any frustration in spending considerable time without any financial reward he certainly did not show it. Last night, I went to what will become an annual event for me. It was the Jackson Hole Land Trust Picnic. The food was great, the scenery inspirational, and the common purpose of the guests uplifting. A large white tent on the Bar BC Ranch off of Spring Gulch Road was the epicenter of the festivities. 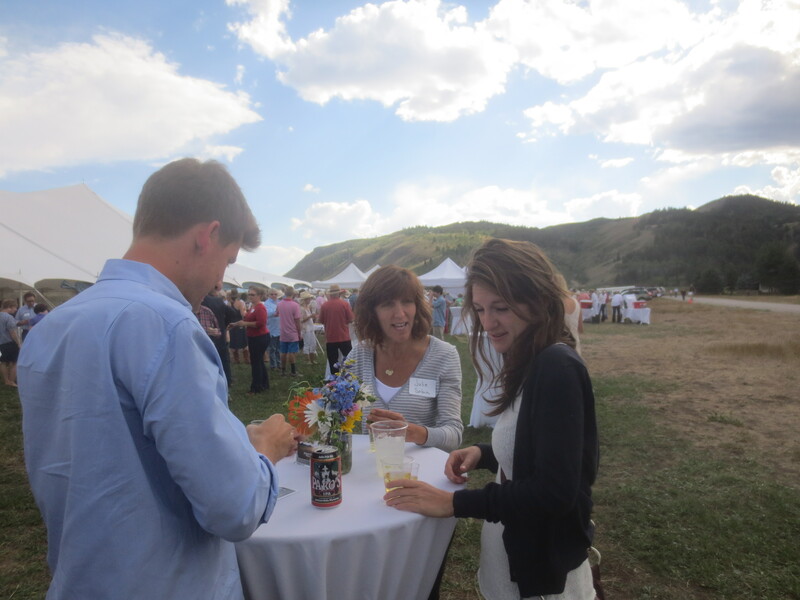 Music, a raptor demonstration, and an open bar with coolers filled with cans of local beer led off the meal. Of course, a shot of Wyoming Whiskey helped put me in the proper frame of mind as well. Then generous helpings of barbecue (and for those that know me well generous helpings is an understatement) – followed by cake, strawberries and whipped cream left me satiated. The Jackson Hole Land Trust is a private, non-profit organization that strives to preserve the incredible vistas, necessary wildlife habitat and open spaces that all of us love. 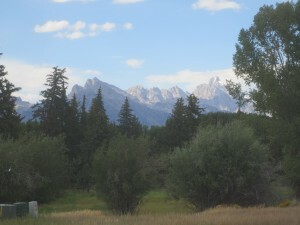 Despite the fact that 97% of Teton County is park land, the remaining 3% is privately held and without careful stewardship could result in permanently changing the unique character of Jackson Hole. The Land Trust strategically identifies critical land that must be protected for the enjoyment of future generation. It then works with land owners and local government to protect land from further development through donations, purchase s and conservation easements. Whether you are a resident or a visitor there is something refreshing about mingling with more than a hundred people in a magical setting with just enough of a cool breeze to balance any heat generated from the setting sun. It was easy to spot friendships being renewed and new ones formed. We ran into friends of our daughter and their new baby. Just last year my twenty-something year old kids tubed the Snake River with them and had a fabulous time. Of course, once my wife spotted their newborn, she just had just had to hold that baby for as long as she could. Seven trees stand green and tall atop a burnt, but not barren hillside. How did they survive the fires that engulfed the northwestern shore of Jenny Lake? 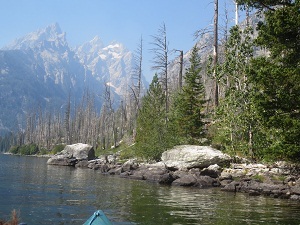 How could I have gone eight years recreating all over Jackson Hole without once kayaking in the early morning placid waters of the Lake? Those were my thoughts as my wife and I glided along the shoreline. We arrived at the boat dock about 9:00 AM on September 3rd. It was the last day of the season. The Jenny Lake Boating concession was closing a month early because of unusually low water levels. According to an attendant this was due to heavy early season snow run-off caused by high temperatures followed by a dry summer. My wife and I are no strangers to kayaking. We have glided through frigid ocean teeming with life in Alaska, protected water off the San Juan Islands, placid boat channels in Vancouver and a misty lake in Connecticut. We may not have refined our two person kayak technique, but we have learned the fine art of arguing about who is paddling harder, who is paddling better, and who wants to paddle at all. Sixteen years ago I arrived in Jackson Hole with my family for a first family trip out west and had no idea what I was getting into. I was a veteran flyer and avid traveler, accustomed to navigating my way through airports, baggage facilities, interminable rental car lines and endless airport traffic. After flying for several hours, including a stop in Dallas with a long delay, by the time we approached Jackson Hole, my wife’s nerves were frayed from her fruitless efforts to keep three young children from de-composing into a primordial display of pre-adolescent fireworks. Of course, my attempts to remain in blissful ignorance of their impending explosion, was repeatedly frustrated by continued spousal reminders that I had responsibility for the kids too.